Are You Retired And Need Extra Money? Welcome, my name is Deanna. I guess this is where I tell you about myself and how I got into affiliate marketing. I am a retired hairdresser, having owned my own business for many years while still raising my four children. Being a single Mom with 4 children and having my own business kept me very busy. So when I retired I was bored. Plus, I wasn’t rich. Wanting to find something to do from home I began to research on-line to get an idea what was available. Little did I know that the minute you look into work at home ideas online that you will receive all kinds of offers to sign up for the next latest and greatest “get-rich-quick” program. After researching many sites, I got interested in affiliate marketing. It looked like the simplest path for someone with very few skills in the computer area. When I first started affiliate marketing I read a book from a “guru” and it really peaked my interest, but his course was way too expensive for me. So I just kept searching the internet to see what was available. After many weeks of researching affiliate marketing, keyword research, domains and all the unique words affiliated with the internet, I started to understand it, a little. After joining some small and simple training courses that were fairly reasonable, I was not having any success. In the beginning I jumped around a lot and went from one new shiny object to the next, looking for the right one. Some I tried for a while and others were just looking for more money. I got involved in a couple that had you purchase their program or software and after a few months they just closed down, taking my money with them. You have to be careful what you sign up for. There are no get-rich-quick schemes out there that work, mostly they just try to get more and more money from you. They are the ones getting rich. I tried many sites and tried many programs, including coaching without much success. Some of them just closed down, some were o.k. but didn’t explain well enough and some just wanted more money. How would you like to become an entrepreneur? Sounds fascinating doesn’t it? Well, it’s possible to achieve success in the on-line world and earn very good money. That why I want to help keep you from making the same mistakes I did. It can get very discouraging and make you want to give up. I know my family thought I was on a wild goose chase. My son would say it’s nothing but a scam. But being stubborn, I kept searching. Then I found Wealthy Affiliate. I studied it for a few days and then went looking for something better. MORE MONEY! At that time I was chasing my tail for quite a while and was ready to quit this venture. Then I stumbled on Wealthy Affiliate again and it had developed so much that I signed up for the premium account that same day. WA is the real deal. Yes, Wealthy Affiliate is the real deal. They are many members who are willing to help you every step of the way. I think last count there was 1.3 million members. Some very active and some not so active. Many have achieved much success financially and otherwise. 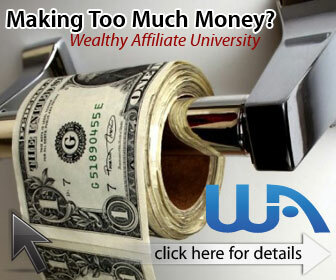 Read my review of Wealthy Affiliate and you will see it’s the only course you will ever need. 2 free websites for the newbie. Wealthy Affiliate is FREE to join and the training is excellent. But remember, affiliate marketing is work. You have to write lots of content and a host of other tasks to do. But the work is well worth the time and energy spent. My advice to you is stay on one path, the Wealthy Affiliate path and success will come. In my spare time I love to cook, bake, and entertain. I am thinking of writing a family style blog with all the different recipes handed down in my family from generation to generation for all my family to enjoy. I also love going to all my grandsons baseball and football games. I also helped start a diet and exercise class at the Elks lodge for all it’s members. I also make a dessert once a month for the Veterans when they have their free spaghetti dinner at the Elks. Very rewarding, because they really enjoy the homemade desserts that I love to prepare. I want to help people to earn money online because today many retired people do not have a good retirement income. I know I’ve been there. Many live on social security only, even though they worked hard all the lives. Life has a way of dealing many hard blows, which many times make us dip into retirement fund or savings. You never know what’s ahead, a bad business deal, sick child, parents or other unexpected upsets. I know, I’ve been there. Hopefully, if you are willing to work hard and follow all the steps, you too, can achieve financial independence. Remember the 20%-80% Rule. 20% of the people have 80% of the money, why, because 20% of the people are willing to work harder and smarter than the other 80% want to. My goal is to do all that I can to help you achieve financial success and help you have a blast doing it. Hopefully, you will join me in our quest for financial independence. It’s very good to meet you and I look forward to seeing you in Wealthy Affiliate. If you would like to comment or ask a question, please leave a comment below or go to my profile. Are you earning to much money?